Update: Due to the weather there will be no 6:30 PM Rooftop Stargazing. The AAAP Meeting convenes at 7:30 PM inside the Science Stage. There is another group meeting at 7 PM inside the Science Stage for a brief orientation. We wish to extend a warm welcome to AAAP members, guests, AAAP Facebook Fans, Wagman Star Party Fans, Mingo Star Party Fans, etc.! 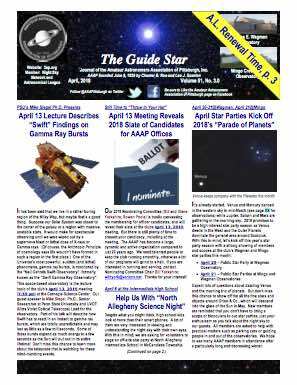 Join us as we kick-off the 2018 Astronomy Weekend with a pre-meeting Meet & Greet with Roof Star Gazing at 6:30 PM (weather-permitting) at the Carnegie Science Center Planetarium-Rooftop Observatory, 1 Allegheny Ave, Pittsburgh, PA 15212. Members may bring their telescopes. The meeting starts at 7:30 PM in the Planetarium. AAAP members remain for the business meeting after the lecture. The meeting presentation features Dr. Amy Keesee, a Research Associate Professor in the Physics and Astronomy Department at West Virginia University. Dr. Keesee’s research focuses on ion dynamics in the Earth’s magnetosphere. As a member of the NASA TWINS Mission of Opportunity Science Team she studies ion heating during geomagnetic storms using Energetic Neutral Atom data from the TWINS and the MENA (from previous NASA IMAGE Mission) instruments. Additionally she works in Dr. Earl Scime’s Lab, using laser-induced fluorescence to understand ions and neutral atoms in helicon source plasmas. Through a collaboration with NASA IV&V Educator Resource Center she teaches workshops and a summer course for pre-service and in-service educators to learn about Sun Science and Space Weather using iPads. She is very involved with the West Virginia Chapter of the Association for Women in Science. Dr. Keesee has three sons she is raising in Bridgeport, WV where her husband is a hospitalist internal medicine doctor. Get ready to enjoy a talk on delving into current NASA heliophysics research on Sun activity at an ionic level and its implications to Earth as well as how school age children can learn Sun Science and Space Weather. These AAAP events are free and open to the public. There is a $5 Parking Lot Fee.